I know I’m not alone in finding something compelling about the places where people are known to have met their ends; and something was compelling me to visit the place where one of England’s most formidable medieval kings, Edward I, snuffed it on 7th July 1307. No doubt a psychologist would be able to offer an explanation for both inducements. In any event, there is something fascinating about Edward I. Well-educated and highly intelligent, he brought stability to the land after the civil wars that blighted his father’s reign and is renowned as an effective monarch, a just law-maker and for his role in the development of Parliament. At 6’ 2”, Edward towered over the majority of his subjects – hence his nickname, Edward Longshanks. He was ruthless – as you would expect – and intimidating, with a reputation for having a furious temper; the Dean of St Paul’s is said to have died of fear in the king’s presence. Yet was he tender too? When his beloved wife Eleanor died in Nottinghamshire in 1290, he was so heartbroken that he ordered memorials to be built at every place her body rested on the way back to London, ending at Charing Cross. Edward and Eleanor were clearly a devoted couple and had at least fourteen children together; he had another two with Margaret, his second wife. 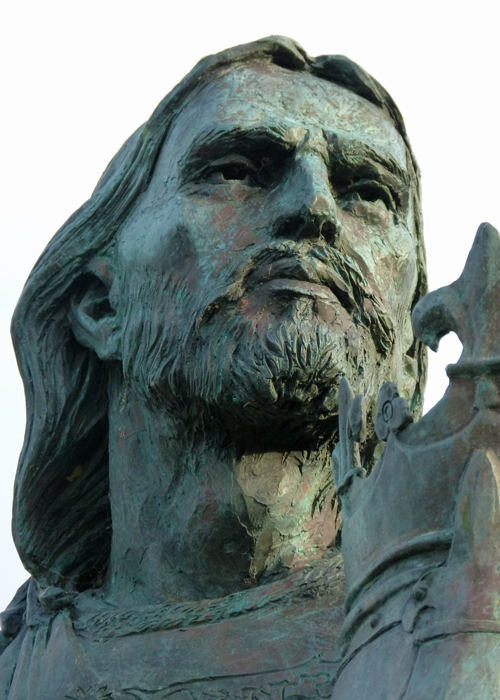 But Edward I was also a warrior, a crusader, conqueror, subjugator of the Welsh, builder of castles, persecutor of Jews, famed for his wars in France, Gascony, Flanders – and Scotland. Painted on his tomb in the 16th century were the words, Scottorum malleus – hammer of the Scots – which he tried very hard to do, though I’m pretty sure Edward was motivated more by his own 13th century sense of order, and power: rather like ‘the Godfather’, this was business, and probably not personal. Neither he, nor I suspect any of his adversaries, were nationalists – a meaningless term in those far-off days. Were the Scots grateful for all this attention? Surprisingly, they were not. But, even in England, Edward doesn’t always get a great press. A memorial stands on the very spot where he died. It is on the English side of the Solway Firth, the large body of water that since 1092 has marked the border with south-west Scotland and which forms the mouth of the rivers Esk and Eden. Edward was on campaign at the time, with an enormous army poised to ford the water, invade Scotland and settle things once and for all with his one-time vassal, Robert the Bruce. Aging and ill, the king allegedly had dysentery: apparently, he just couldn’t keep going (so to speak) and expired in the arms of his servants, aged just 68. A memorial was first erected in 1685 (why did they wait that long? ), though the current one dates from 1803, and it’s placed exactly where his tent was. Don’t ask me how they know that. 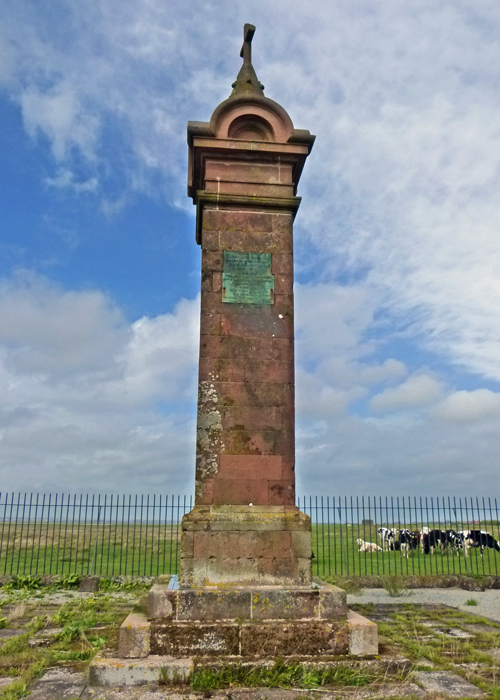 To reach the memorial, you need to go through the tiny village of Burgh by Sands, west of Carlisle. It feels a bit like bandit country: a couple of locals stared at me as I drove through; surely, they’re used to seeing other people by now? They must have TVs and kettles and everything. I waved, beamed at them and, gratifyingly, they looked cross. 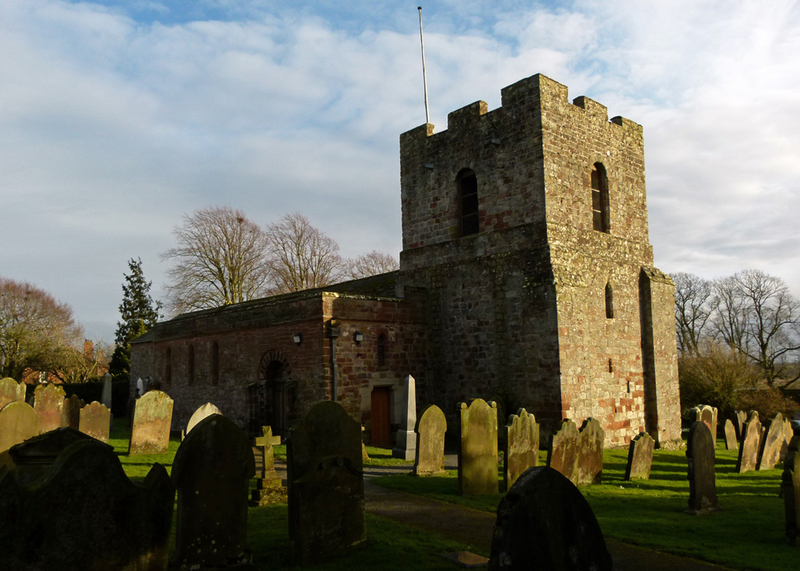 Actually, Burgh is a pretty village, built where Hadrian’s Wall ran, with a must-see church, St Michael’s, and – potentially – a welcoming looking pub. About a mile north of the village, the car bumps to a halt on a piece of gravelly mud. You can make out the shape of the memorial in the distance. I knew from a previously aborted attempt that my customary sartorial elegance would be misplaced, so I’d made a point of sporting a pair of scruffy jeans and had brought a pair of waterproof boots to change into. It was just as well, because the track was even soggier than it looked, and badly maintained. There was a piece of no man’s land, where the track ended near a pair of wrecked and rusting cars, and the memorial lay in another direction. I negotiated a particularly boggy bit, crossed a stile, jumped like a gazelle from one strategically placed stone to the next and headed off on the final leg. It had only taken about 10 minutes, but it seemed like a trek to the end of the world. The only sounds were the wind, gusting hard and hissing through the coarse grass, overlaid by the faintly ethereal warbling whistle of a passing curlew. There was no sign of the Solway Firth, as such – I was probably too close to the ground to see it – but it seemed to be seeping up all around me anyway. Edward’s memorial was guarded by cows; not nice, quiet, bovine creatures, but curious, faintly menacing, ones with mad, staring, eyes. I’ve known cows all my life (well, you do, don’t you) and I swear they’re getting more aggressive. Anyway, I didn’t like the way these ones looked at me. I could see the headline: “Middle-aged fattish bloke with camera mauled by flock of cows”. Not prepared to go down without a fight, I picked up a stick and they reluctantly backed away. I had wanted to spend some time at the memorial pondering on the life of this terrible and intriguing king. I had even brought a Kit-Kat with me, as an aid to concentration. However, it was not a place for quiet contemplation. It was hard to picture a massive army camped hereabouts, banners waving, armour clanking, men calling to one another, the smoke from cooking fires in the air. All I could think was, “What a miserable place to die”. 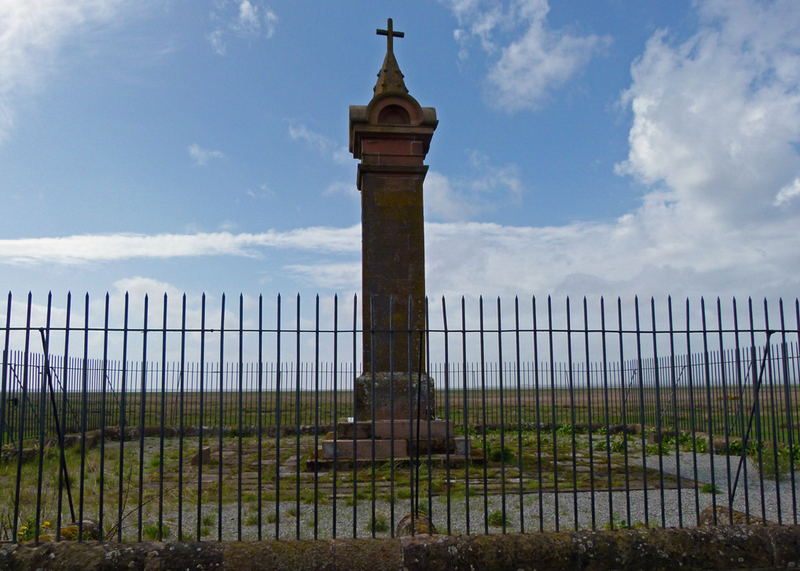 The monument itself is pretty unexceptional and surrounded by a rusting iron fence – presumably to keep cows, Scots, Welsh etc out. Depressed by the damp bleakness of the place, I just took a few snaps and left, making vaguely threatening noises at the cows as I went. The Kit-Kat was eaten in the comfort of the car. Not much of a visitor experience, I thought; but that wasn’t really the point. Back in Burgh by Sands, which is in all seriousness definitely worth more than a casual glance, there’s a fine modern statue of Edward I on the village green, between the pub and football pitch. It was a gift from Story Construction to mark the 700th anniversary of the king’s death in 2007. 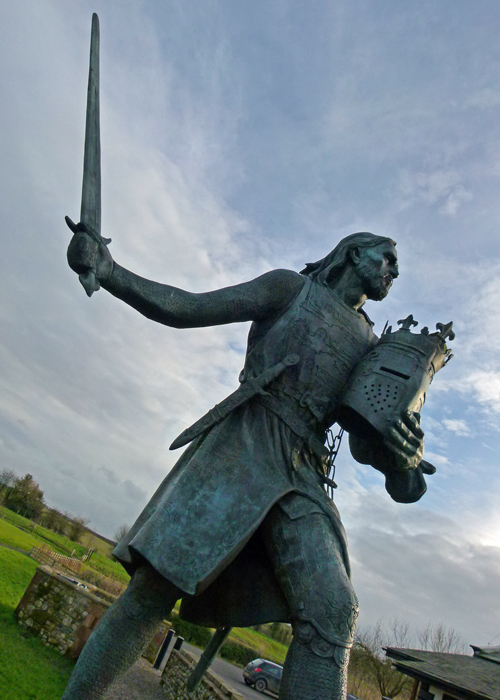 Sculpted by Christopher Kelly and unveiled by the Duke of Kent, the statue depicts a vigorous man in his prime, armour-clad, hair loose and flowing, brandishing a sword. Edward would have preferred to be remembered that way, rather than as a sick old man, expiring as his tired body failed him in a remote part of his kingdom on his way to yet another war. Legend has it that Edward I left word that his embalmed body – or, in some versions of the story, just his bones – should be carried into Scotland until the battle had been won. What actually happened was that his body lay in state for awhile in nearby St Michael’s, before its long journey south and burial in Westminster Abbey on 27th October. His son and heir, the new king, Edward II, packed his father’s army up and sent it home. The place does look pretty grim but the statue is fabulous. Edward has a fearsome reputation as a warrior king, hated by the Scots and Welsh and, as you say, probably many English people too. They used to show a video at Caernarfon Castle describing some of the things he did while conquering Wales (naturally, from the Welsh POV). The Christopher Kelly statue certainly does justice to that warrior status. 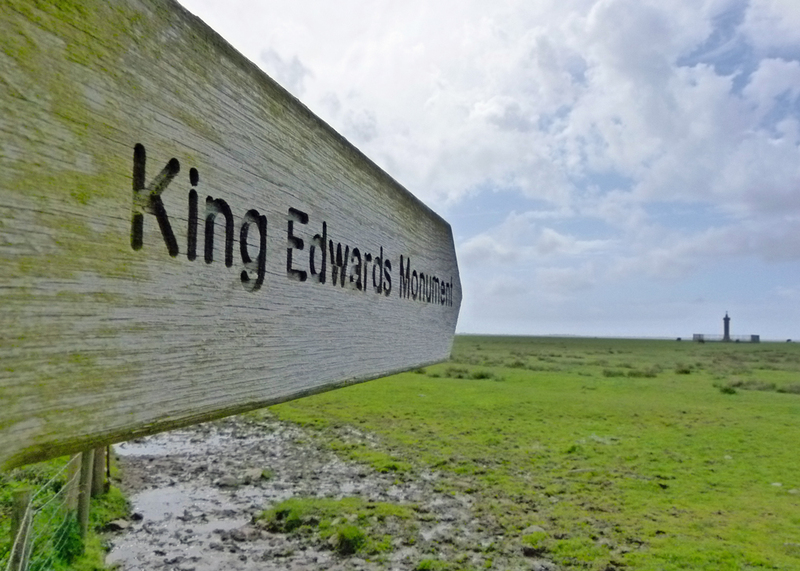 The location of the memorial marking where Edward died reminded me of the one marking the place where King Alfred held out from the Danes at Athelney in the (then) Somerset Marshes. Visitors can’t get to that at all, as it’s in the middle of a farmer’s land! The info about it is on the lane some distance away. We didn’t have your joyful experience with any aggressive cows. Lol. (They probably only wanted your Kit-Kat.) I imagine the farmer might allow influential groups, or even individuals, to get to the Athelney memorial, but (lacking that influential status) we didn’t bother to hunt him out to ask. I really enjoyed reading this post! Thanks. The Solway Firth can be a bit bleak on a warm summer’s day; from the look of your photos you must have visited in the spring. Thank-you for visiting the memorial and all the research you have done. The memorial could do with a bit of a scrub and tidy; the pleasant-looking signpost encourages one to think that it is cared for. Interesting, there must be some ancient ancestor of yours that must have suffered at the hands of royalty and when you visit these places of their demise, your forefathers are having their revenge! There, I have settled it for you, no need to spend money on some head doctor! Interesting post, as always. Love the close up of the statue, very handsome. I think he is rather handsome. Thank You for the post, I always pass them on to my boys. They think the statue looks a bit like Aragorn from Lord of the Rings movie. how was he Edward I? What about the Confessor? Following on from above, of course Elizabeth II is still Elizabeth I of Scotland to some Scots – though the question was (unsurprisingly) addressed decades ago. 1) The monarch can call him/herself whatever s/he likes. 2) The regnal number should be allocated based on whichever country had the most before. So if the UK had a king Robert he would be Robert IV, because there have been three previous king Roberts in Scotland – though none in England. Hi Mike – I have relatives who live in the village – but I haven’t been there for decades – but communicate with them. Also when I went I was a mere ‘smidgeon’ of a thing – uninterested in anything historical … so I really need to go back. A flock of cows! – do cows in Britain fly, then? 😀 That statue is fabulous; all statues should be so good. So glad you made the trip and have written a detailed account as I can’t see myself ever going anywhere near the monument. Once I read there were cows in the vicinity then I would be off. I can see where the statue is and when it was erected. But when did the memorial column go up, who commissioned it and who paid for it? Somebody must have thought it was important to mark the very spot where Edward died. Good questions: I don’t know! I think of Edward as one of the great examples of history depending on who is writing it. To the English, he was a great king. To the Scots (like me), (and the Welsh I presume), he’s a monster. The sack of Berwick always come to mind when I read of him, 10,000 men, women and children slaughtered. So I’m glad his statue is “unexceptional” and in a “miserable and bleak” place! Sorry to let my Scots ancestry creep through like this; hope you won’t stop reading my blog! I thought you were Canadian, Stew .. 🙂 I guess all history is relative to some extent, but we should be wary of judging past events entirely by today’s standards? Personally, I would also be cautious of getting too carried away with the Scots-English thing; many of the chief protagonists at this time were Anglo-Norman and I don’t think they had what we would recognise as a nationalist agenda. Edward WAS a great king, but he was a medieval monarch and not necessarily a very nice person – especially if you crossed him. The sack of Berwick was a shocking event – obviously barbaric by our standards. The numbers for the dead vary from one account to the next, I think. I believe the Scottish castle garrison was allowed to march away, having sworn not to take up arms against Edward again. BTW – many of us have Scottish ancestry and Mrs Britain is a Scot. And Seasons in the Valley is a brilliant blog! I’m fascinated with this. Rick’s family lore has it traced back to a King Edward — which doesn’t narrow the field all the much (and he might know more; I don’t.). We all know how reliable genealogy can get once you get past the folks you know but we’d all like to think it was true and whomever put it together clearly did. But the fact is, we don’t know all that much about Eddie I, II or III so this is well worth a forward! Sorry about the contemplation but those cows looked fierce. I suspect there was a good pub in or near Burgh that could help wash down the Kit Kat! I think if you go back that far we’re probably all related anyway! Rather bleak, at least at that day. You do have to wonder- how could they know precisely which spot it was. Even without the cows it looks a pretty miserable place for a campsite, especially in those pre-KitKat days. There can’t be too many people who take the trouble to visit and I doubt your words will encourage a touristical stampede. I think I’ll stick with Westminster Abbey, but so nice of you to go to all the trouble to take us along to the Solway Firth. Do you worry about quicksand out there? That’s not much of a memorial to a great king. The statue’s quite fun, though. Going to battle at an advanced age was a bit of a thing in the Middle Ages. I’ve been reading today about William Marshall who was in his seventies when fought a battle at Lincoln in 1217 in support of Edward I’s father. William Marshall was a famous knight! Have you seen his effigy in Temple Church? I think there might be a cast of it in the V&A too. No, I haven’t seen his effigy. There’s a photo of it in the book. I got to his death this morning. It was quite moving.